Our interview this morning is with Paul Kim, founder of eCarServices (www.ecarservices.com), a new startup--funded by friends and family--developing an online site designed to help people research prices for auto repair services. The firm is launching a beta of its web site today, and we thought it would be interesting to hear more about the company. What is eCarServices all about? Paul Kim: We're the first Internet company to bring price transparency to the world of auto repair. How we do that, is we have a feature on our site--an estimator--which allows car owners to verify their auto repair price estimates. When you take your car to a mechanic, right now there is no way for a consumer to figure out if an estimate is in the right ballpark or a fair range. You can go to our web site and select your specific make and model of car, and we tell you what those operations should cost. How it started, is I was in that situation myself two years ago. I asked myself--how do I know if my mechanic is giving me a fair price? It happens that my own mechanic is a friend of mine, and I asked him that question myself. He told me that there's really know way you'd know. I looked online to see if there were any solutions, and there weren't. The business idea was hatched and was born, and since then we've been compiling a database to create the service for people. Where are you getting all of your information from? Paul Kim: What we've done is compiled our own survey amongst Los Angeles mechanic teams here. We've taken a random sample of a variety of estimates. There are companies that produce gigantic databases of pricing estimates -- companies like Chilton's, Mutual One, and All Data, and we don't have a database as comprehensive as that, though in the future it would be good to have something as big. What we've done is captured 20 percent of the major repairs. We're using the 80/20 rule for repairs, because 20 percent of the major repairs account for 80 percent of what people need. It's been a painstaking process so far. We've literally been sending out surveys, getting responses, and collecting the data. Plus, my mechanic, who has fifteen years of experience, has cross checked the information with other sources. Is this something users of the site can help provide feedback and information on? Paul Kim: We also have user forums, and are launching a feature which allows people to create their own vehicle profile. It's not exactly a social network, but it allows them to add a specific car make, model, and year and list repairs they've done. Eventually, they will be able to sync that up to other users. One thing I've noticed is lots of cars have proprietary issues. If you have an Acura, Honda, Toyota, or BMW--any specific manufacturer--they have bugs and quirks. It's similar to computer hardware. It's good to know, especially if you want to know if you should fix or junk the car, or when you're buying a new car if there's risks of ownership over the long term. User generated reviews and repair experiences are vital for our site to be successful. That's what Web 2.0 is all about. Paul Kim: My background was an economics degree from Columbia. I started by career at Morgan Stanley in New York, in investment banking. But, I wanted to pursue a career in technology, so I went to work for a company called Ariba in Silicon Valley. I got caught in the late 90's in the dot com bust, and moved back south to Los Angeles, and got involved in mortgage banking at IndyMac Bank. It was not exactly something I was passionate about. In 2000, I decided to go back to technology, which was what I wanted to do. I left IndyMac Bank in 2006, just before the mortgage meltdown. As I mentioned the way the business started was, I had a couple of repairs that had to be done to my car. In ever other industry in the Internet--in new and used car sales, and pretty much any other commodity on the web--we have price transparency. You can get some kind of baseline of what wholesale or retail costs are. With servicing, this is not entirely true. It's got a high price point, and if you don't have that information you can be out $500 for no good reason. Other than helping people keep from getting bamboozled, I thought it would be really cool to help people. My business partner and I saw that there was nothing else on the web, and figured out a way to crack this. 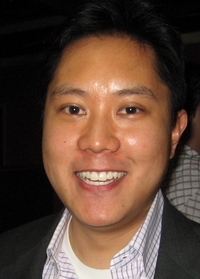 Paul Kim: The other Web 2.0 theme now is how to build a web company that makes money. Right now, we're just doing advertising as the basic revenue model. As we get more traffic, our goal is to become a way to generate leads for mechanics and insurance companies. The way that will work is if we can refer leads to mechanics and demonstrate ROI, they should be willing to give us a subscription or pay us a transaction for new leads. The way we've priced it out, is there's a $50 acquisition cost for a new customer. If we can bring two new customers a month to a mechanic, we can charge them $100 a month, and the rest is all gravy. But, we haven't yet figured out the right price point, it may be $50 or $250. How's the company funded and backed? Paul Kim: Right now, we are using friends and family money--that's what we've been doing for the last couple of years. We're now actively seeking angel and first round investments. We're hunting for capital at this point to accelerate development and market ourselves better.